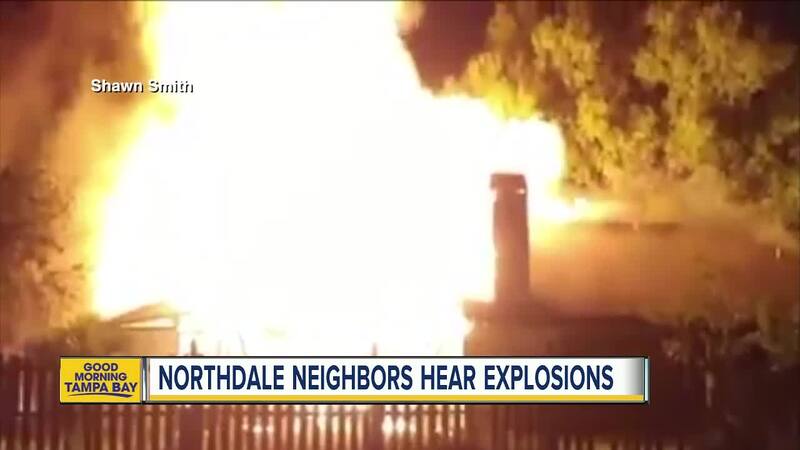 Flamethrowers and live ammunition exploding in a Northdale home engulfed in flames sent firefighters running for cover on Monday night. 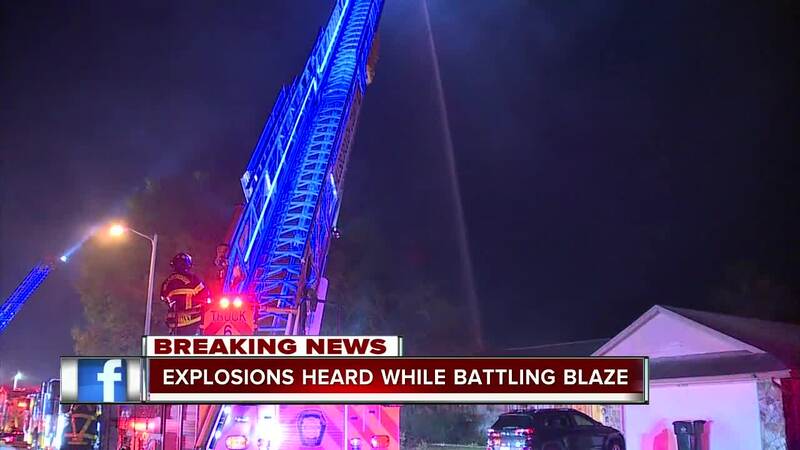 HILLSBOROUGH COUNTY, Fla. — Flamethrowers and live ammunition exploding in a Northdale home engulfed in flames sent firefighters running for cover on Monday night. Crews responded to 16311 Norwood Dr. just after 7 p.m. Monday after a neighbor called 911 after smelling smoke and seeing flames coming from the house next door. Hillsborough County Fire Rescue firefighters had to duck for cover as explosions started going off in the home. As firefighters went into the home, they had to get out when they realized it wasn't safe. According to the Hillsborough County arrest log, a man was arrested at a house nearby on unrelated charges. Patrick "Pat" O'Brien, 53, was booked into the Hillsborough County Jail on Monday night and charged with burglary of an occupied dwelling with assault and aggravated assault on a law enforcement officer . He is being held with no bond at this time. O'Brien is the lead guitarist for the death metal band Cannibal Corpse. O'Brien lived at the Norwood home where the fire started, according to deputies. "Very scary, I was thinking 'my house it’s going to go if they don’t hurry up and get here' but they saved our house and we don’t have any damage or anything," neighbor Tammy Lay said. 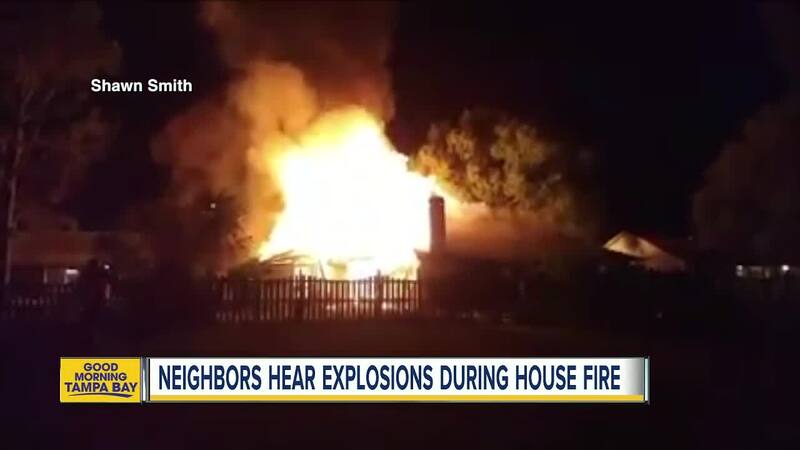 On Tuesday morning, deputies moved news crews back 300 feet and evacuated six homes around the house because of "something that's inside the home." Hillsborough Fire is investigating the scene and working to determine a cause of the fire. ABC Action News' Kelly Bazzle and Sean O'Reilly contributed to this report.